Max Ebel was born in Speyer, Germany, on June 1, 1919, the second child of Max Ebel, Sr. and Wilhemina Lehr. His father was a master carver and sculptor, an excellent musician and a decorated World War I veteran. His workshop was at his home in Speyer. Growing up, Max also learned the trade and apprenticed to another master carver. Max belonged to the German version of the Boy Scouts and later the Red Cross. The years after World War I were very difficult and, like many Germans, the Ebel family struggled. Max Sr., a bit of a “bohemian artist,” became estranged from his wife and answered the call of a friend to do stonework on the National Cathedral in Washington, DC. He left Wilhemina and three young children in September 1929 looking for a better life. 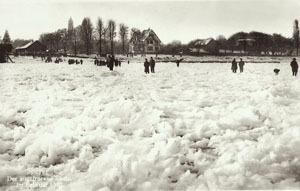 Max always remembers that was the year the Rhine froze, a very rare occurrence. Max never saw his dad again until he came from Boston to visit in 1936 with his new wife. At that time, he was already a naturalized United States citizen. With the German economy on the rocks, things only got worse for the family left behind. They were virtually destitute and Hitler’s thugs started to take hold of the country. Max got rickets from malnutrition. Some of his happiest memories are of his time with the Boy Scouts and the Red Cross. He wanted nothing to do with the Hitler Youth and steered clear of it. Max was always a pacifist. He cannot explain why, but he thinks it stemmed from his father’s wartime experiences. Max Sr. was in hand to hand combat in France, and was forced to kill a man to avoid being killed himself. Every year, for days leading up to the June anniversary of this event, Max Sr. would become sullen and depressed. 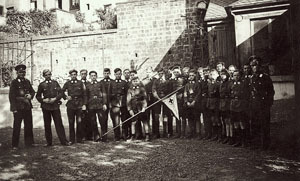 Late in 1936, all the boys were required to join the Hitler Youth and Max’s boys’ organizations were merged into the Hitler Youth. Max still refused to join and came under increasingly hostile pressure from young nationalistic teenage boys. In early 1937, this culminated in a knife fight with another boy, a member of the Hitler Youth, as others cheered for their Hitler Youth comrade. Max was stabbed badly in the hand, grabbed the knife to save himself and slashed the other boy’s face. He escaped, but life in Speyer became very dangerous for him. He needed to get out. He was 17. A decision was made. He was to join his father in America. Max Sr. had established a woodworking shop in Cambridge and could use his help. He went through a hasty procedure to obtain his passport, riding his bike back and forth to Stuttgart, no small feat. Wilhemina signed the document permitting him to leave. His boss wrote a letter of recommendation. Max left Germany from Hamburg in May 1937 on the SS New York bound for New York City. He had a German nickel in his pocket, a suitcase filled with his woodworking tools and a new wool suit, shoes, a shirt and his coat. He never saw his mother again. On May 28, after an enjoyable weeklong voyage, he arrived in New York Harbor where his father met him. They walked on a hot day from the harbor to the train station and Max was struck by how dirty New York City was. On June 1, he celebrated his 18th birthday with his father in Boston. Max recalls: “I was an American right from the beginning, and I always will be. I think I appreciated my freedom as much as a fish let out of a bowl to swim in a river.” That freedom was short-lived, however. The very influence Max had fled Germany to escape had followed him, in the form of a cloud of suspicion. “I left Germany because of the Nazis, and I came over here and I was treated like a Nazi,” he said. Max was happy working with Max Sr. in Cambridge. He befriended a fellow employee, an African American named Johnny, who taught him English. He taught Johnny German. He joined the Boy Scouts and went to school to study to become a United States citizen. Later he became a Junior Air Raid Warden. He lived among many other German immigrants in a large, socially active German American community in the Boston area. Max Sr. was a very popular man who frequently served as the master of ceremonies at many area dances at German American clubs. Local Germans also went to picnics and had a great time with their friends. As was common with immigrant communities, German diplomats mingled frequently with the community, as well as seamen from ships docking in Boston Harbor. Max Sr. was also a member of a German World War I veterans’ group of about 10 men who met at each other’s homes to play cards and enjoy each other’s company. They took turns being the president of the nonpolitical organization which had limited ties to the World War I veterans’ group in Germany, the Kyffhauser Bund. The group raised funds and existed pursuant to a permit issued by the Secretary of State. The money primarily went to widows and orphans of World War I veterans. Whatever it might have been in Germany and how the money may have been divided up, for Max Sr. it was a social organization, like so many veterans’ associations. Max remembers how much fun in it was to tour a German freighter, the Pauline Friedrich, impounded in Boston Harbor in 1939, after Germany invaded Poland. The first mate who arranged the tour was an old school friend of Max Sr.’s from Speyer, who he hadn’t see for years. Several of the German seamen later had dinner at Max Sr.’s home. During this time, Max was also getting letters from Germany demanding that he return to serve in Hitler’s Army. Max burned the first two letters. When the third arrived, Max Sr. took him to the consulate where they persuaded the consulate to strike his name from the rolls. Max refused to return to Germany to fight for something he did not believe in. The Ebels didn’t know it, but they were being watched by the FBI, along with many others in Boston’s large German American community. Years later, researching her father’s internment story, his daughter, Karen, learned that the FBI knew of the visit to the boat, Max Sr. hosting the dinner at his home for the seamen and their visit to the consulate. He recalls that the FBI had a picture him leaving the consulate with his father. Max was later relieved of his volunteer duties as an air raid warden. He never knew why, but he was hurt and disappointed. He enjoyed the work and the chance to help his newly adopted country. The Ebels’ Cambridge Woodcraft Company continued making fine furniture. Amazingly, under the circumstances, they secured a contract with the United States Navy designing and building lifeboats that wouldn’t overturn or sink. Max filed his Declaration of Intention to Become a U. S. Citizen on December 5, 1941. On December 7, 1941, the Japanese bombed Pearl Harbor and life changed drastically for Max. President Franklin D. Roosevelt immediately issued the necessary Presidential Proclamations pursuant to the Alien Enemies Act declaring all Japanese, German and Italian aliens to be “enemy aliens” and placing them under the jurisdiction of the Department of Justice (Read more in History). Along with over 1,000,000 resident aliens, Max had to register at the local post offices, be fingerprinted and carry a picture ID. 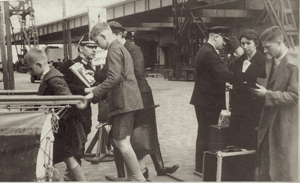 No enemy aliens were allowed to have radios, cameras, firearms and their travel was severely restricted. Max’s citizenship plans stopped and he registered with the Selective Service. When asked if he would fight for the US in Germany, he no. He did not want to fight against his cousins, brother and friends in the land of his birth. He was classified as 4C. Sometime in August 1942, the Ebel home was searched twice by the armed FBI detectives. A Presidential warrant had been issued after Pearl Harbor authorizing searches of homes in which an enemy alien, such as Max, resided. One time, Max told the officers about a secret compartment in the nightstand he’d designed. They stood with guns drawn as he unlatched the hook and opened the compartment. They left the Ebel home with Max Sr.’s radio and camera, even though he was an American citizen, as well as various German language books and a calendar. Nothing was ever returned. On September 21, 1942, Max Sr. was served notice by the Army that he was to appear at a hearing on September 25 to show cause why he should not be excluded from the Eastern Military Are due to “military necessity.” (See Related Laws) Max Sr. was questioned at length without an attorney and returned home. On September 28, Max, then 23, was picked up from work for questioning. Max never returned home. He was sent to the Boston immigration station where he remained with other detainees, German and Japanese, for 3 months. He was permitted limited visitation rights and very little exercise. The few reading materials available had everything about the war cut out. He was never told why he was there. 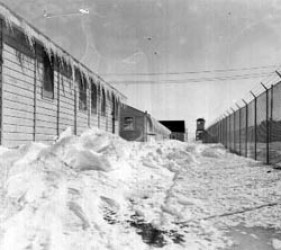 (More information about the East Boston Temporary Dention Facility) Sometime in the next few weeks, Max was sent for his internment hearing. He had no counsel and had no right to question the proceeding. He was permitted two character witnesses and his father attended the brief hearing. Max recalls it lasting about 15 minutes. He hardly spoke. The civilian hearing board was comprised of 3 local appointees. The district attorney chastised Max and laid out “evidence” against him, as did investigating FBI agents. The primary objection Max recalls is that he didn’t want to fight in Germany. The attorney told him that if his son could fight, Max could damn well fight, too. He also told Max that it was his pleasure to fight Germans in World War I. Max returned to his cot at the immigration station. He remembers several things from his time being detained in Boston, one he discusses with great difficulty. One day he heard water running in the toilet room. A fellow German detainee, a doctor, yelled for Max. An elderly Japanese man was hanging over the toilet, slashed on either side of neck and a jagged razor on the floor. They saved his life. He returned later with a cloth around his neck. The man worked 6 days a week for a local family and on his day off he went to have his shoes shined at a place that happened to be across from a GE plant. He was detained because the FBI assumed he was a spy. Another Japanese man gave Max a rosary with a crucifix which opened to disclose a small compartment which could hold a relic or some other holy object. The man told Max he could take the rosary—all Christianity did for him was get him in trouble. The FBI assumed he was using it to smuggle microfilm. He was also detained with a German member of the Hapsburg family. 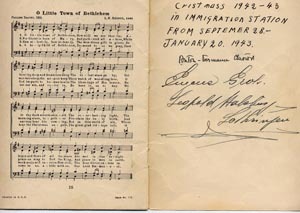 A local women’s club gave the men Christmas songbooks because they spent Christmas in the immigration station. Max remembers waiting for his hearing with a very anxious German man and his wife whose face was covered with red sores. The woman was sent to the local Home of the Good Shepherd run by Catholic nuns. The man, Mr. Groh, later joined Max and signed his songbook. Finally, on January 20, 1943, Max was advised he was being moved immediately to Ellis Island, along with several others. The Alien Enemy Control Unit of the Department of Justice, headed Edward Ennis (later head of the ACLU) did not accept the parole recommendation of his hearing board and Attorney General Francis Biddle ordered him interned. (Max Ebel’s Internment Order) With no notice to anyone, he was put on a train and sent to Ellis Island. He remembers Ellis Island as the dirtiest, most crowded place he was during his internment. Hundreds of German men were packed into a huge room. The only source of privacy was blankets hung from the top bunk. For this reason, Max was glad to have a bottom bunk. The food was terrible and the medical care nonexistent. Infrequent exercise was behind barbed wire fences outside overlooking the Statue of Liberty. Lady Liberty seemed to mock the immigrants she invited to her shores. Max became ill and was refused medical care “because he was being shipped out the next day.” And so he and many other German internees continued their journey—to Ft. Meade, Maryland. The trip from Ellis Island to the mainland was difficult. The men were transferred to military custody. The soldiers were very hostile and pointed their guns menacingly at the men. The captain screamed that he didn’t get if they went to Ft. Meade upright or feet first. Once they got to the New Jersey shore, they had to line up and many civilians stared at them. Max thinks everyone had been told that they were German prisoners of war. When they got into the train, the shades were drawn and the windows were nailed shut. Soldiers were on every car with their rifles. Max was at Ft. Meade for about two weeks. He didn’t mind the stay. He got medicine for his severe sore throat and ate well thanks to the German cooks interned there from New York City. Even the soldiers enjoyed their cooking. He got a physical and vaccinations there before moving on to Camp Forrest in Tullahoma, TN, on February 24, 1943. 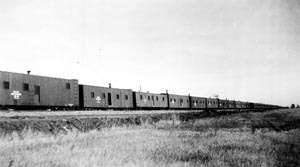 The internees were taken there in a shuttered train under guard, although the shades were lifted in some of the more rural areas. Max remembers stopping somewhere along the trip through the Appalachians and seeing some of the locals in the forest. Camp Forrest was run by the Army. Rumor had it that a German internee was shot dead before they got there by a nervous camp guard. At Camp Forrest, there were quite a few more men and they lived in 5- or 6- man huts. There were black widows everywhere when the men arrived. Max recalls muddy ditches to contain the water. Max always wanted something to do and signed on to help the military doctors treat internees. He had a good relationship with the doctors and when the internees were being shipped out to make room for German POWs, they wanted him to come with them, but were not able to work it out. Max was disappointed. In late May 1943, the men were shipped to a variety of camps, most of them to Ft. Lincoln in Bismarck, ND. Again they were taken by rail under guard with the shutters down in populated areas. Ironically, Max’s first cousin who had been drafted into Hitler’s armed forces arrived at Camp Forrest shortly after Max’s departure as a German POW. The men lived either lived in brick buildings with large rooms holding many beds or in smaller temporary barracks. They were expected to help with the functioning of the camp and Max served in the kitchen peeling potatoes many times. He hated being behind barbed wire and still had no idea why he was being incarcerated. He wanted out. In September 1943, he got his chance. 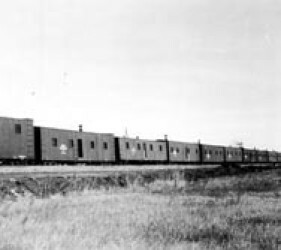 The Northern Pacific Railroad was looking for help because most of the able-bodied men in the Dakotas had enlisted with the military. 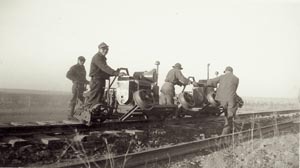 The U.S. government worked with the German government and eventually the men were cleared to work with the railroad. The camp officials requested volunteers and 500 men signed up. This was eventually whittled down to about 100 and Max was one of them. 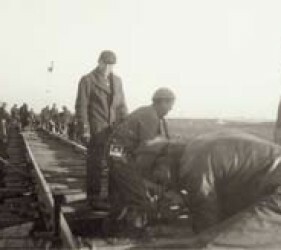 The men were to replace existing rails with 250 lb. 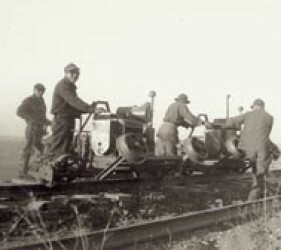 rails which would accommodate wartime munitions traffic across the country. This was perceived by some in the camp as helping the U.S. war effort and they bitterly opposed the men who had agreed to help their “jailors.” It made life for the volunteers uncomfortable for a time. 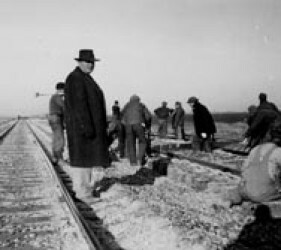 On September 3, 1943, Max and over 100 other volunteers left Ft. Lincoln and arrived in Buffalo, ND, to begin work on the railroad. The men lived in the boxcars, 6-8 men/car, that were heated by a coal stove. Water was held in a tank car at the rear of the train. There were no bathroom facilities besides the great outdoors. They lived in these cars throughout the winter and Max only returned once or twice to Ft. Lincoln. It was a very rough existence, but Max preferred it to living behind barbed wire. Max worked with other men on the spike puller. The train was stationed in various towns and the men were allowed to go into the towns, under some observation, and visit the restaurants where they got to know the townspeople. Max greatly appreciated this little bit of normalcy. 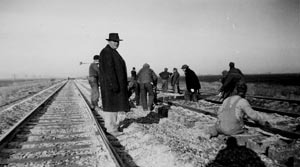 The work train had to work on a spur in the Standing Rock Indian Reservation. During this time, the men met many of the Lakota who sold them handmade items off of their buckboards. Max remembers their abject poverty with great sadness and amazement. Once he looked in one of the huts the families lived in and was surprised to see dirt floors. The Indians had pulled up the floors for fire wood to keep warm. The men attended church on the reservation near Cannonball. At one service, the minister begged the men for money to help replace the church roof. 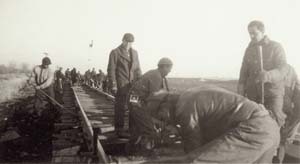 The internees didn’t have much, but they donated some money which they had earned working on the railroad. Later, they were invited to attended Christmas Eve service and have dinner at the church. During the festivities, which Max enjoyed greatly, the internees learned of a 10-year old Indian girl who was dying of TB. The US government hadn’t provided sufficient healthcare, so the men again contributed to help save her. Thus, a kinship arose between these two outcast comm gunities—Native Americans and German internees. Max would remember those times fondly all his life. It was something good that came out of his internment. Railroader Christmas cards. One internee, Karl Klein, took responsibility for his fellow railroaders and continually implored the Department of Justice to review their cases in the hope of winning release. Finally, the DOJ agreed to rehear their cases. The release recommendation of the rehearing board states that the board questioned why Max had ever been interned. (Max Ebel’s Rehearing Report ) When this document was obtained from the National Archives in 1999, it was first summary Max had ever scene of the original rationale for his internment. He had never seen the recommendation before. At about the same time as the rehearing, in April 1944, Max was sent by himself to Ft. Snelling, MN, for a preinduction physical by the US Army. Max found this ironic. He was considered so dangerous he was interned, but was trustworthy enough to fight for United States in the war. Max flunked his physical and never joined the Army. In June 1944, he was paroled and returned to Boston where he had to report to his parole officer once a week. He was not allowed to go near railroad or subway lines which always rankled him considering that he had helped build them while interned. Finally, his parole was terminated in November 1945 and the family nightmare of the past four years ended. 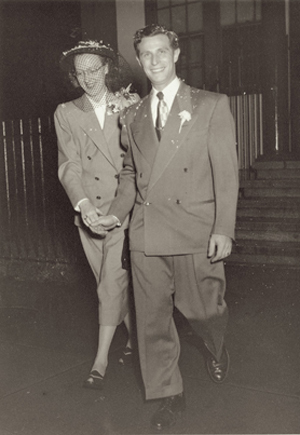 After internment, he returned to work for his father, met Doris Eckert and married in October 1948. He became a United States citizen in 1953, 12 years after filing his intention to become a citizen on December 5, 1941. His citizenship application was intensely scrutinized because of his internment. He recalls the folders brought by the government to a related review as being “a mile high.” He told them that they seemed to know more about him than he did. In a way, that was true. Max never knew why he was interned and never saw any documents related to his internment. During his later years, living and working in New Hampshire, he never spoke of his internment. His three daughters knew only that he helped build railroads in North Dakota during the war. They also knew that he met Indians there who he admired. The girls always enjoyed looking at his “Indian treasures” from those years. But to his daughter, Karen, the eldest, the railroad saga always seemed a little odd. In the 1980s, Karen was in law school and Max was refurbishing his father’s house in Boston following his parents’ deaths. At the time, the Japanese American story was starting to be told. Max sent Karen an article about her grandfather. It stated that Max Ebel, Sr. had been served with an exclusion order pursuant to Executive Order 9066 in April 1943 giving him 10 days to leave the East Coast. Shortly thereafter, Max Sr. filed a request for an injunction to prevent the Army from enforcing the exclusion order, but without contesting the facts alleged. (To do so, Max Sr. relied on the kindness of a Harvard Law graduate with whom he was acquainted through his woodworking business and who was outraged at the civil liberties implications of the order. They filed the injunction request purely on constitutional grounds.) The court issued a temporary restraining order and the case came before Justice Francis Ford in August 1943 in federal district court in Boston. He issued his opinion in September 1943 refusing to enforce the Army’s order finding that military necessity did not exist and ordering the Army to withdraw its order. When doing additional research, Karen discovered that the Army only obeyed the court order in June 1944 after first seeking to limit the geographic area covered by its exclusion order, an offer the court rejected, and initiating denaturalization proceeding against Max Sr., an effort which was abandoned. Coincidentally or not, June 1944 was when Max Jr. was paroled and allowed to return to Boston. Karen also learned from transcript given to her by Arthur D. Jacobs, that Edward Ennis of the Department of Justice worked closely with John Hall, an attorney for the Army coordinated the government’s defense in Max Sr.’s case and several others pending at the time. Among other things, Ennis hoped to convince the courts to accept the word of government with respect to the evidence presented without actually having to disclose the evidence or the names of the informants. He hoped that by establishing this trust and by “tricking” the court (his word), further disclosure would be unnecessary. Ennis asserted that, “All these district judges, John, are just dying to do their patriotic duty for the country. They just fall right into your lap. It’s disgusting.” He also stated that Max was interned because of his father’s activities and Max Sr. was suspect because his son was interned. (The Ennis Transcript) In the end, thanks to Judge Ford’s decision to uphold Max Sr.’s constitutional rights, his case and several others finally led the Army to terminate its individual exclusion policy. Unfortunately, because the facts alleged by the government regarding Max Sr. were not contested and are recited in the court’s opinion, the incorrect and unsubstantiated allegations have been taken as fact by others through years. Since the first public telling of his story, Max has continued to speak of his internment whenever he is asked to do so. In October 2003, he revisited Ft. Lincoln for the opening of the North Dakota University Museum of Art’s commemorative exhibit entitled “Snow Country Prison.” At a related ceremony, many former German and Japanese internees shared their stories. 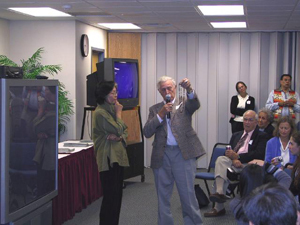 Max tearfully returned the crucifix he had gotten 60 years earlier from the Japanese man in Boston to a representative of the Japanese American community. 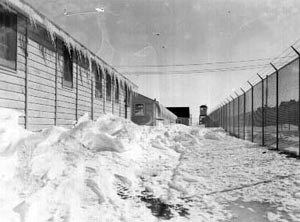 (Martha Nakagawa – Snow Country Prison). 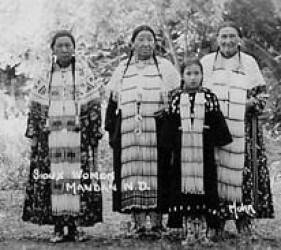 Max also miraculously reconnected with the family of the little Indian girl the internees helped to save whose name he learned was Alma Thunder Hawk). He went back Cannonball to the Standing Rock Reservation and was treated with great kindness by the Thunder Hawk family. 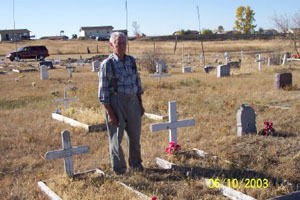 Butch and Bud Thunder Hawk, Alma’s brother’s sons, and their mother, took Max, Doris and Karen out on the reservation to try to find the foundation of the church where Max first learned of Alma and her plight. Mrs. Thunder Hawk remembered the church well. After much trekking, they miraculously found it buried in brush. Max and Butch stood together on the three steps that led to the church’s front door that Max remembered so well. Max visited her grave site with Butch and learned that Alma died shortly after the internees’ Christmas Eve gathering at the church. This visit was very traumatic and healing for Max. Max’s courage in publicizing his story and his ongoing desire to help prevent internment from recurring became a quest late in his life. His daughter, Karen, joined him in his quest and together they hoped that their work would result in greater protection of civil liberties by the US government and greater appreciation of the value of American freedom by the public. Their greatest hope was that one day federal legislation would pass acknowledging the internment of ethnic Germans and requiring the US government to review the Alien Enemies Act which caused so much anguish for so many during World War II. Karen’s dream was that this legislation would pass in her father’s lifetime and that he would have a chance to present his story himself before a federal commission established to review the internment of Germans. Sadly, this dream died when her father passed away on May 3, 2007. 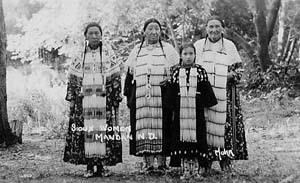 One of the very last things he said to her before he died was that he hoped she would continue the quest for federal recognition even though he could only be with her in spirit. She committed to do so, but as the years go by and Congress continually refuses to pass even this small measure, she wonders if the dream she shared with her father will ever be fulfilled. By Karen Ebel with her father, Max Ebel, Jr. In July 2012, Karen Ebel recorded an oral history for the Story Preservation Initiative, a group who’s mission “is to create and make available to the general public a diverse collection of oral histories of people who have exhibited a talent, passion, commitment, or way of living that has served to enrich the human experience.” Her recollections about her father’s experiences are available on the Story Preservation Initiative website.